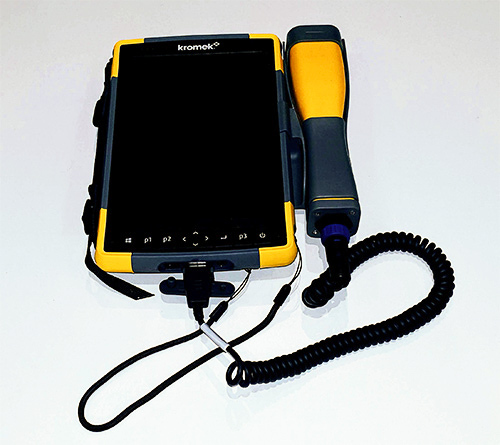 It can output a variety of reports including date/time, user handheld ID, photo and audio note, GPS positioning, radiation spectra and isotope identification. Variations in normal operating conditions can often affect the performance of radio-isotope identification, the RayMon10’s advanced 10 cubic centimetres CZT coplanar grid detector provides more stable performance than scintillation-type detectors. Rugged handheld tablet platform with easy-to-grip, impact-absorbing bumpers with hand strap. Sunlight-visible WXGA (1280×800) 7-inch (178mm) display shows images, maps and data in ultra-sharp detail. The screen works in portrait or landscape orientation. Chemically-strengthened Dragontrail High Ion-Exchange cover glass for excellent impact and scratch resistance. Integrated GPS for location tagging. Inbuilt front and back camera to record location. Large touch screen easy to use with gloves with large buttons mapping the important menu items for use even with heavy gauntlets. Rugged case provided to keep everything secure during transportation. 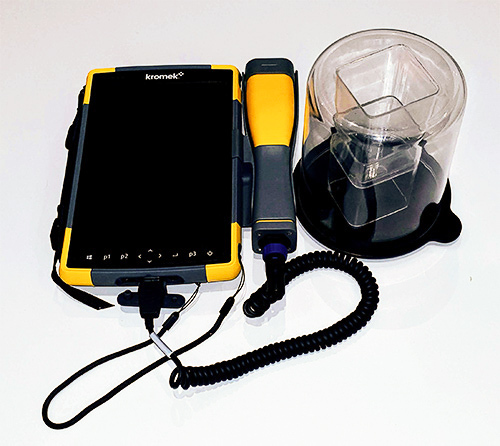 Raymon10 software features dose measurements, spectra and Radbar indicators. Pelicase with Raymon10 tablet, GR1 inside probe, hand strap, stylus, charging cables and instructions. Pelicase with Raymon10 tablet, GR1 inside probe, one Radbeaker (volumetric beaker), hand strap, stylus, charging cables and instructions. Can be used with distributed (soil, building material sample, liquid waste) and point source (air sampling filters, calibration sources) sample. A smaller CZT crystal (0.5c m3 instead of 1c m3 ) for use on a nuclide source which is more active with a higher dose rate. If you need to do more detailed analysis than can be done on the tablet for example, to compare readings over time, look at readings from more than one detector, etc. you can use Kromek’s gamma spectroscopy software and import data straight from the Raymon10. For further product information, information on customisations or to request a quote, click the button below to send us a message.